Kenneth L. Dorsney is the Chair of Morris James’ Intellectual Property Practice. He is a registered patent attorney with nearly 20 years of experience resolving patent, trademark, trade secret and copyright disputes in the District of Delaware, through litigation, mediation and dispute resolution. Ken’s practice focuses on the representation of corporate clients and the interests of outside counsel in a wide variety of complex intellectual property matters. Ken is the chair of the firm's Intellectual Property group practice. According to IAM Patent 100 magazine "Trial-savvy Kenneth L. Dorsney boasts "excellent credentials"; a registered patent attorney, he has a commanding grasp of the legal and technical issues at play in any dispute." Ken has spoken at numerous seminars and law schools on patent law and litigation and is Editor-in-Chief and Co-Author of the ABA's ANDA Litigation: Strategies and Tactic for Pharmaceutical Patent Litigators, first and second editions, AIPLA and Bloomberg Law's Evidence in Patent Cases, and the ABA's Pre-ANDA Litigation: Strategies and Tactics for Developing a Drug Product and Patent Portfolio, first and second editions. Amgen Inc. v. Hetero USA Inc., et al. AstraZeneca AB v. Aurobindo Pharma Ltd., et al. Bayer Intellectual Property GMBH, et al. v. Aurobindo Pharma Ltd., et al. Blackbird Tech LLC v. Garmin Ltd., et al. Bristol-Myers Squibb Co., et al. 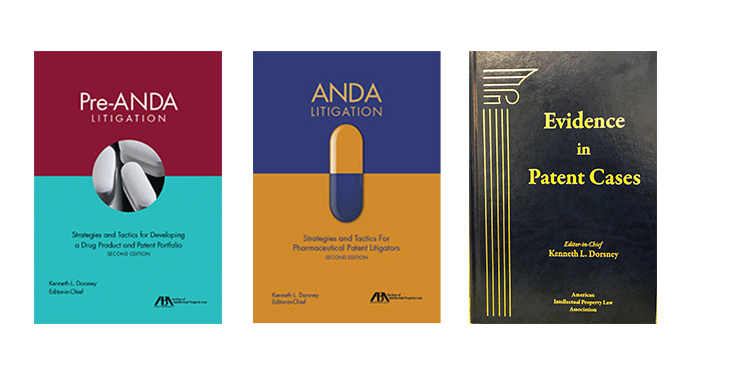 v. Bionpharma, Inc.
Cubist Pharmaceuticals LLC v. Sagent Pharmaceuticals, Inc.
Forest Laboratories, LLC, et al. v. Apotex Inc., et al. Fresenius Kabi USA, LLC, et al. v. Sagent Pharmaceuticals, Inc.
Genuine Enabling Technology LLC v. Sony Corp., et al. Memory Integrity, LLC v. ASUSTek Computer, Inc., et al. Pfizer Inc., et al. v. Micro Labs USA Inc., et al. Onyx Therapeutics, Inc. v. Sagent Pharmaceuticals, Inc.
TQ Delta, LLC v. ZyXel Communications, Inc., et al. UCB, Inc., et al. v. Apotex, Corp. and Apotex, Inc.
Wyeth LLC, et al. v. Apotex Inc., et al. Summit Data Systems LLC v. EMC Corporation, et al. Finjan Inc. v. McAfee Inc., et al. McGrath v. Datex-Ohmeda Inc., et al. Serverside Group Limited et al. v. CPI Card Group – Minnesota Inc. et al. Select Retrieval LLC v. Amerimark Direct LLC et al. Polar Electro Oy v. Suunto Oy et al.|Asahi Glass Co Ltd. et al. v. Guardian Industries Corp. Round Rock Research LLC v. Macy’s Inc.
Verance Corp. v. Digimarc Corp. (Delaware) et al. Universal Innovations LLC v. CS Industries Inc. et al. Where 2 Get It, Inc. v. Geo Tag Inc.
Warnock v. GetFugu Inc. et al. American Cruise Lines Inc. v. HMS American Queen Steamboat Co. et al. Starhome GmbH v. AT&T Mobility LLC et al. Alkermes Pharma Ireland Limited et al. v. Torrent Pharmaceuticals Limited et al. Technology Innovations LLC v. Amazon.com Inc.
Chalumeau Power Systems LLC v. Allied Telesis Inc. et al. FastVDO LLC v. Apple Inc. et al. FotoMedia Technologies LLC v. Facebook Inc. et al. ChriMar Systems Inc. et al. v. Cisco Systems Inc. et al. Digital CBT LLC v. TiVo Inc.
Digital CBT LLC v. AT&T Inc.
EIT Holdings LLC v. Barnes & Noble Inc.
Golden Bridge Technology Inc. v. Amazon.Com Inc. et al. Microsoft Corporation et al. v. GeoTag Inc.
Chalumeau Power Systems LLC v. D-LINK Systems Inc., et al. Neptune Technologies & Bioressources Inc. v. Enzymotec USA et al. Infoblox Inc. v. BlueCat Networks (USA) Inc. et al. Marketlinx Inc. v. Industry Access Incorporated et al. Chalumeau Power Systems LLC v. Enterasys Networks Inc. et al. Law Clerk for The Honorable Mary Pat Thynge, United States Magistrate Judge, U.S.